Macaws are one of the most charismatic and colorful species you’ll find in the Amazon. Members of the larger parrot family, their size and vivid plumage, along with their rather loud behavior, make them hard to miss amongst the rainforest canopy. Here’s everything you need to know about this beautifully-bright tropical bird that can be found throughout the Amazon region. These birds possess a brilliant plumage, and a coloring that is suited to the Amazon jungle with its bright fruits and flowers and vivid green canopies. Different species of macaws possess varying bright colour combinations, such as blue and gold or green and red, along with sporting beautiful long graceful tails. A macaw’s facial feather pattern is highly distinctive and thought to be as unique as a fingerprint. They have long toes and sharp claws which they use to latch onto branches and examine items, and their first and fourth toes point backward. They’ve also been observed using their powerful beak as a third leg! There are around 376 species of parrot throughout the world, and macaws are the biggest of all of them. The largest species, such as the Hyacinth macaw, can span up to 3.5 feet in length, including a huge wingspan of around 4 to 5 feet. The largest macaws weigh between 2 and 4 pounds and they have especially light bones which aid their flight. Macaws are native to South and Central America, found anywhere between Southern Mexico and Northern Argentina. They prefer rainforests, but can also be found in other types of forests as well as woodland and savannah-like habitats. Types of macaws that are particularly common to the Amazon include the blue and yellow macaws, the scarlet macaw and the red and green macaws, along with numerous others. Their diet mainly consists of fruits, seeds, leaves, flowers and nuts. Most species possess a large and extremely powerful beak which they use to open nut shells, including such foods as tough as coconuts. In the Amazon, macaws can be seen congregating at clay licks along river banks where they feed on the damp soil. There are various theories about why they do this. It may be a way for them to neutralize the assorted toxins in their fruit and seed-filled diet and to aid digestion. Others have highlighted that clay licks are a valuable source of minerals, particularly sodium which is hard for animals to obtain in the rainforest. Whilst macaws are apparently immune to the poisons found in many of their foods of choice (such as the seeds of Hura crepitans), they are thought to find cherries, avocados and chocolate poisonous! Once they reach breeding age at around 3 to 4 years old, macaws will pick a partner and stay with them for life. What’s more, pairs spend a great deal of their time together, not only for breeding, but also to share food, groom and in caring for their young. They can also be observed flying close to each other (almost touching) throughout the forest canopy. You will most likely hear a macaw before you see it. These birds are highly intelligent and gregarious creatures that congregate in flocks of anywhere between 30 and 100 individuals. Their loud calls, squawks and other distinctive vocalizations can be heard reverberating throughout the jungle, especially in the early morning. All this noise isn’t just for entertainment purposes. It’s used as a way to mark territory, communicate with the flock and identify partners. Whilst macaws can’t exactly talk, they are famous for their ability to copy human speech, along with other noises in their environment. In captivity, they can be trained to imitate and practice specific words until they perfect exact sounds and even accents. But why do macaws mimic people? In short, they are highly social and intelligent creatures, and are thought to have a particularly well-developed vocal learning centre in their brain. Wild macaws are naturally programmed to create and respond to very specific sounds made by their family and wider flock members. In fact, a parent will give each of their chicks its own “name” and all members will know how to reproduce these individualized calls. Macaws live to be around 60 years in the wild on average, and in some cases this can extend for up to 80 years and even as long as 100 years. When kept as pets, macaws are often known for outliving their owners! In the wild, their long life span can be attributed to their relative lack of predators. Scientists have identified a total of 22 species of macaws. Of these, five are extinct (including the glaucus macaw and Spix’s macaw), three are critically endangered (the hyacinth macaws, red-fronted macaws and blue-throated macaws), four are listed as endangered, whilst all the rest are considered to be under threat. This pessimistic state of affairs is largely a product of illegal trapping for the bird trade. The birds’ charisma and entertainment value has made them popular pets worldwide. As with many other Amazon species, deforestation and habitat degradation also pose a significant threat to population numbers. Did you enjoy these top 9 macaw facts and fancy seeing them for yourself in the wild? 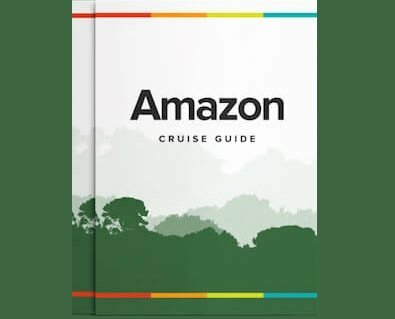 Contact Rainforest Cruises today, or call us 1-888-215-355 to start planning your Amazon River tour.